Since 2008, only long form vital records are available from the City Clerk's office. The cost is $15 for the first certified copy and $7.50 for each additional copy of the same record requested at the same time. Birth Records if the parents lived in Gloucester at the time of the child's birth; the child was born in Gloucester; or both. Marriage Records if the intentions were filed in Gloucester. Death Records if the deceased died in Gloucester; was a resident of Gloucester at the time of death; or both. 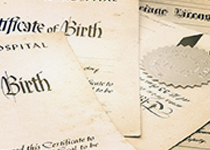 Some birth and marriage records are restricted records under Massachusetts Law. In order to be allowed access to such documents, valid ID must be shown by the person requesting the document (a photo copy of ID if mailing a request). Only those listed on the document will have access to the record. To request a certified copy of a vital record from the City of Gloucester, please download the Vital Record Request Form. Mail the completed form with a check or money order for the correct amount, and a No. 10 Self-addressed stamped envelope to the City Clerk's office, 9 Dale Avenue, with a special attention to "Vitals". Visit the Registry of Vital Records & Statistics for additional information on vital records. Click here to view the increase in fees for records requested through the Registry of Vital Records and Statistic which became effective June 3, 2013.